The tale of a simple act of faith between two young people – one Israeli, one Palestinian – that symbolizes the hope for peace in the Middle East. Winner of a Christopher Award, Booklist’s best adult non-fiction book of 2006, and finalist for the National Book Critics Circle Award. In 1967, Bashir Khairi, a 25-year-old Palestinian, journeyed to Israel with the goal of seeing the beloved stone house with the lemon tree behind it that he and his family had fled 19 years earlier. To his surprise, when he found the house he was greeted by Dalia Eshkenazi Landau, a 19-year-old Israeli college student, whose family had fled Europe following the Holocaust. On the stoop of their shared home, Dalia and Bashir began a rare friendship, forged in the shadow of war and tested over the next half century in ways that neither could imagine on that summer day in 1967. 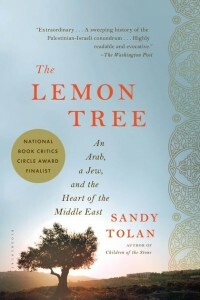 In The Lemon Tree: An Arab, A Jew, and the Heart of the Middle East, Sandy Tolan brings the Israeli-Palestinian conflict down to its most human level, demonstrating that even amid the bleakest political realities there exist stories of hope and transformation. The Lemon Tree grew out of Sandy’s award-winning documentary for NPR’s Fresh Air. The book won a Christopher Award for “affirming the highest values of the human spirit” and was Booklist’s “Editor’s Choice” for best adult non-fiction book of 2006. It was also a finalist for the National Book Critics Circle Award. In 1948, hundreds of thousands of Palestinians were forced to flee their homes to make way for the new state of Israel. More than 50 years later, the villages of Palestine remain intact in the imaginations of refugees and their descendants. I’ve been traveling to the Holy Land for about ten years now, and early on in my journeys I came across something deeper, quieter, and more melancholy than the noise and blood and rage of endlessly recurring headlines. I could see it in the faces of aging women in exile, transfixed before the television screen on Christmas Day, gazing at the Church of the Nativity, just at the end of Star Street, where they were born. I could hear it in the voices of grandfathers remembering a family lemon tree, or the silk and indigo of the Wednesday market, or the truckloads of zetuns bound for the olive press at harvest time. This was longing: an attachment to land and village going back to 1948, when 750,000 Palestinians fled or were driven out of their homes in the new state of Israel. In my trips to the West Bank, Israel, Jordan, Egypt, and Lebanon, I would come to understand that this sense of longing could not be disconnected from the current violence, or from the “peace process” that never leads to peace. Indeed, the longing for 1948 seems the one main thing unexamined in the countless words of copy and miles of videotape spilled over the Arab-Israeli conflict. For the elderly refugee living in a camp in southern Lebanon, who can gaze upon the lights of his native land, or for the middle-aged exile in Nebraska whose mother still holds the key to a stone house that no longer exists, the longing forges into political and human aspiration, embodied in a phrase that is never far from Palestinian lips: the right of return. Yet the longing also creates a physical and psychic disembodiment. For many refugees, the memories, even passed onto the third generation removed from the village, seem more vivid and real than the camps where their families have lived for more than 50 years. Despite several UN resolutions, and after years of ambiguous language, the United States has now endorsed Israel’s long-standing position: that a Palestinian return to the 1948 homeland is no longer an option. And indeed, that homeland is, in some ways, imaginary. Yet the aspiration is real, and as deep and abiding as it has ever been. Thanks to Jay Allison and our friends at Transom.org. Original music composed and performed by Mohsen Subhi Abdelhamid. A profile of Shula Mulah, an Israeli woman of Ethiopian descent, who came to Israel in 1984 as part of an airlift called “Operation Moses.” She explores her dual identity and issues of race in Israel. 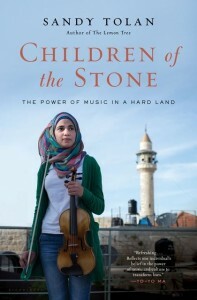 An audio documentary, weaving the voices of an Israeli woman and a Palestinian man whose families occupied the same house, exploring the roots of the Arab-Israeli conflict. An audio documentary, told in first-person by an Israeli woman and a Palestinian man whose families occupied the same house, exploring the roots of the Arab-Israeli conflict. This piece, which originally aired on NPR’s Fresh Air, grew into Sandy Tolan’s award-winning 2006 book The Lemon Tree: An Arab, A Jew, and the Heart of the Middle East. Part 2 of a five-part series examining the role of water in political tensions and the peace process in the Middle East. Part 3 of a 90-minute, five-part series examining the role of water in political tensions and the peace process in the Middle East. Part 1 of a five-part series examining the role of water in political tensions and the peace process in the Middle East. Part 1 of a 90-minute, five-part series examining the role of water in political tensions and the peace process in the Middle East. Developing solar energy is part of the Israeli-Jordanian peace agreement, but the modest plans may be overwhelmed by market forces. Legend has it in the third century BC, the Greek scientist Archimedes devised a spectacular weapon to save the ancient city of Syracuse – a giant concave mirror that bounced concentrated sunbeams onto the sails of invading roman ships. The sails caught fire, the ships sank, and Syracuse was saved. This may have been the only time the sun was harnessed to wage war. But now, in the heart of the Middle East, the sun is a player in the peace treaty between Israel and Jordan. Some say the sun will soon be harnessed in the service of peace. Others wonder if the peace process itself will undermine the prospects for developing clean solar power at a time when developing renewable energy is becoming more and more critical. In Israel, where developing alternative energy was always seen as a matter of survival, solar technology is pointing a way out of dependence on fossil fuels. Story produced in 1995. 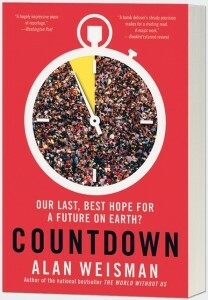 Nearly everyone agrees that fossil fuels will run out someday – some say we’ll start feeling the pinch within 30 years. Predictions of disastrous floods that global warming could bring to island nations like Japan, and to coastal areas of Europe and the United States, may force us to phase out petroleum-based fuels even faster. If so, are clean, renewable alternatives really viable? And can they be developed in time? In Israel, a Middle Eastern country with no oil or coal reserves, scientists have studied one option, solar energy, longer than anyone.